Find the point of reflection. Using the sliders in problem 1 won't let you quite get there so you'll have to use logic or draw circles to determine where the point of reflection might be. The point is a whole number coordinate pair, so no decimals or fractions. Don't spend more than 5 minutes on this problem. As with the last question, don't worry if you didn't get there on your own, the process of trying to figure it out is making your brain smarter! Congratulations! You've finished a magic course. You now have an intuitive grasp of how modern animation works. We will formalize some of these ideas later, which means we'll discuss how a transformation is a function that takes points as input and gives points as output. But for now, you should pat yourself on the back and smile, even if your name is grumpy cat. Yes, I'm talking to all you grumpy cats out there, but especially THE Grumpy Cat. Seriously, smile. Cover your mouth if you can't have people seeing it. If you are my student, you'll need to know how to use the Pythagorean theorem for your homework today. If you don't remember, use another one of my magic spells (or do the spell yourself if you have figured it out). Alternately, you could just ask a friend (remember that I'm your friend too as far as math theorems are concerned). Lastly, here are the standards you were supposed to begin reaching- evaluate yourself and see how you did: CCSS.MATH.CONTENT.HSG.CO.A.1 Know precise definitions of angle, circle, perpendicular line, parallel line, and line segment, based on the undefined notions of point, line, distance along a line, and distance around a circular arc. CCSS.MATH.CONTENT.HSG.CO.A.2 Represent transformations in the plane using, e.g., transparencies and geometry software; describe transformations as functions that take points in the plane as inputs and give other points as outputs. Compare transformations that preserve distance and angle to those that do not (e.g., translation versus horizontal stretch). CCSS.MATH.CONTENT.HSG.CO.A.4 Develop definitions of rotations, reflections, and translations in terms of angles, circles, perpendicular lines, parallel lines, and line segments. 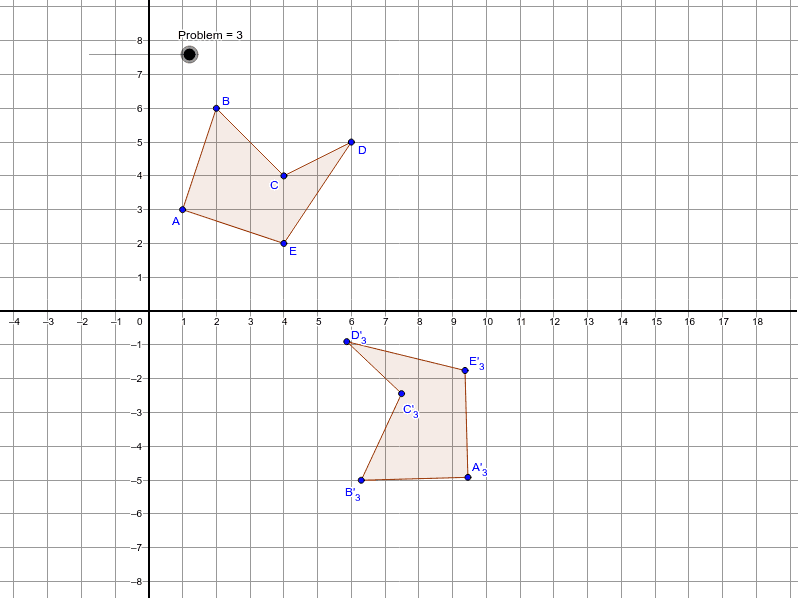 CCSS.MATH.CONTENT.HSG.CO.A.5 Given a geometric figure and a rotation, reflection, or translation, draw the transformed figure using, e.g., graph paper, tracing paper, or geometry software. Specify a sequence of transformations that will carry a given figure onto another. CCSS.MATH.CONTENT.HSG.GPE.B.5 Prove the slope criteria for parallel and perpendicular lines and use them to solve geometric problems (e.g., find the equation of a line parallel or perpendicular to a given line that passes through a given point).